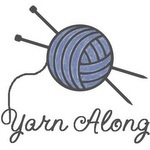 Mama's Notebooks: Yarn Along: Tam! After reading some more of Cather's short stories, I moved on to a novel of hers, A Lost Lady. The short stories were dark and almost had a different moral reality than her novels do. They were very well done but not the right read for me right now. I am only a few chapters into A Lost Lady and I am enjoying it. It's wonderfully written, of course, and has the Cather novel feel: beautiful, poignant, and a bit unpredictable. Something is going to happen and I'm looking forward to seeing what it is! I finished my cable handwarmers and had enough yarn for tam! This is my first tam and it is a fun knit. I'm using Ann Budd's pattern. I can't wait to give both of these to their intended wearer! Love the yarn, the mitts and the tam! Wish I could wear hats, I would make a ton of tams then. Pretty tam. I love that yarn! Maybe one day we will live close enough to do some weekend workshops ;-).